This article is a featured article, and considered to be one of the most informative on this wiki. "I mean it's crazy; we finish each other's—"
In his heart, Tomax Paoli believes a single truth: slavery is freedom. 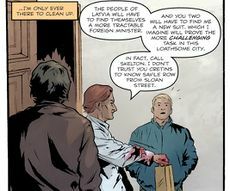 As his connection to his brother and their victory over an undercover G.I. Joe prove, man can only be content when he must answer to another. Raised by the Unione Corse to be peerless businessmen, Tomax and his brother learned on the battlefields of Chad and Libya in their youths that the true measure of success in war is profit, not destruction; and they have since applied these lessons to profit ruthlessly in the boardroom, selling security through their Crimson Guard and growing their empire with Extensive Enterprises. 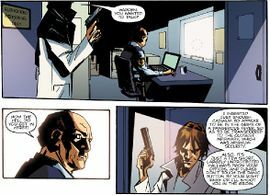 Ultimately, Tomax sees the truth of what Cobra is: control, and he believes in it wholeheartedly. With his fervent belief, he has the potential to rise to the highest echelons of the organization. 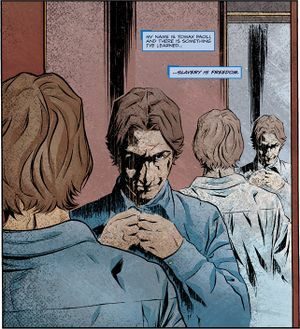 The Paoli twins, Tomax and Xamot, were born on Corsica. 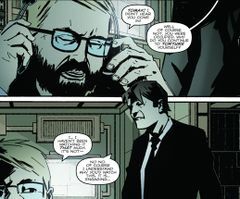 According to Tomax's account, the twins' father died when they were toddlers, and their mother sold them to the Unione Corse — a highly secretive and deadly international organisation centred in Corsica — after she took up with another man, one who didn't want to raise somebody else's children. Heart to Heart Inseparable from a young age, the brothers were raised to be soldiers, businessmen and slave traders without peer, and came to believe that man could only be at peace when they answered to others. Lives Evil When they grew older, the twins had the man that had sent them away killed, and condemned their mother to a lifetime of poverty. Heart to Heart As young men, they fought in the Chadian-Libyan war as soldiers in the French Foreign Legion, under al-Gaddafi; there, they learned that victory in such conflicts comes from profiting, rather than destroying. As the heads of the Crimson Guard, Tomax and his brother were known to their underlings, who believed them to be a single man, as "Mr. X". 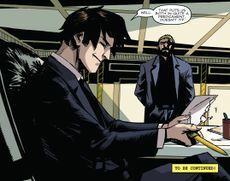 After Chuckles was brought into Cobra, "Mr. X" used him as a bodyguard and driver during his operations in the Balkans; after Tomax killed the Latvian Foreign Minister, he had Chuckles and Semyon clear up after him. 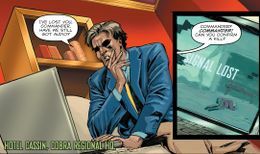 On arriving in America, Tomax dismantled his business holdings to disappear from Cobra's sights and turned himself over to G.I. Joe, offering himself as an asset in exchange for immunity from prosecution and incarceration. 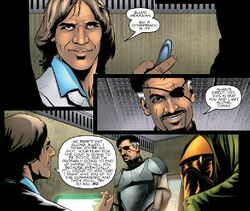 In addition to what intelligence on Cobra and their actions that he could provide, he also gave them 700 million dollars to fund a new intelligence unit headed by Flint, and ownership of The Gemini, a casino that he owned, to use as a base. 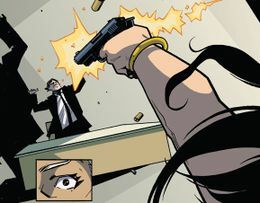 However, Chameleon, who was also joining the intelligence unit, was not informed beforehand of Tomax's presence there; upon encountering him, she reacted with horror, and — despite Flint's efforts to calm her and explain that Tomax wouldn't be allowed to leave the casino — Chameleon took Flint's gun and shot Tomax four times in the chest. 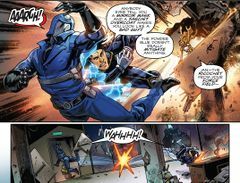 Tomax survived with no lasting damage, as he was wearing a bulletproof vest... but his suit was ruined in the process, something that he was very annoyed about. 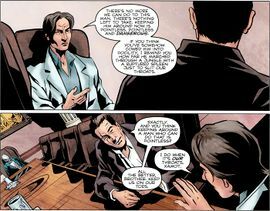 Tomax continued to manipulate Clockspring, persuading him to talk to Bet, the Joes' captive Night Creeper, about the technology he had built for his role on the tiger team. 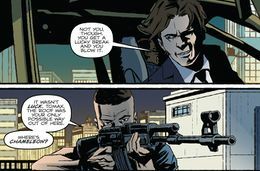 The Boy Most Likely To..., Part 1 After Flint made the decision to disband the intelligence unit, Tomax contacted Firefly and Night Adder, with whom he had been planning to destroy the casino and effect an escape from G.I. 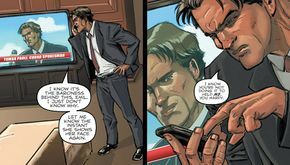 Joe's custody, to accelerate their timetable for doing so to within the next three hours; when the two Cobra agents arrived, Lady Jaye discovered Tomax with Clockspring Bet's detention cell, discussing the casino's security systems. 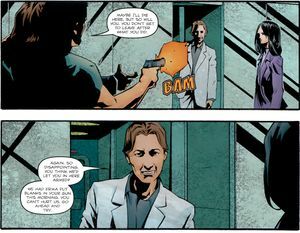 Jaye had Tomax locked into a separate cell, but through his earpiece, Tomax gave Night Adder and Firefly the order to initiate their plan. 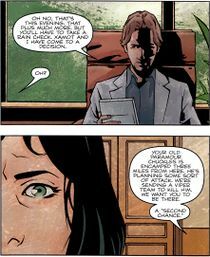 Eye to Eye Through Firefly's sabotage (made possible thanks to the information Bet had gleaned from Clockspring), a power blackout allowed Bet and Tomax to escape from their cells, locking Lady Jaye and Clockspring up instead; despite Clockspring's fears, Tomax pledged not to kill his "friend"... because Tomax wanted him alive to see how badly he had ruined everything. 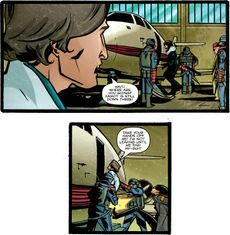 Tomax's Cobra Commander outfit is the "classic" design, based on Cobra Commander's original action figure, rather than one of the reinterpretations previously seen in IDW continuity.